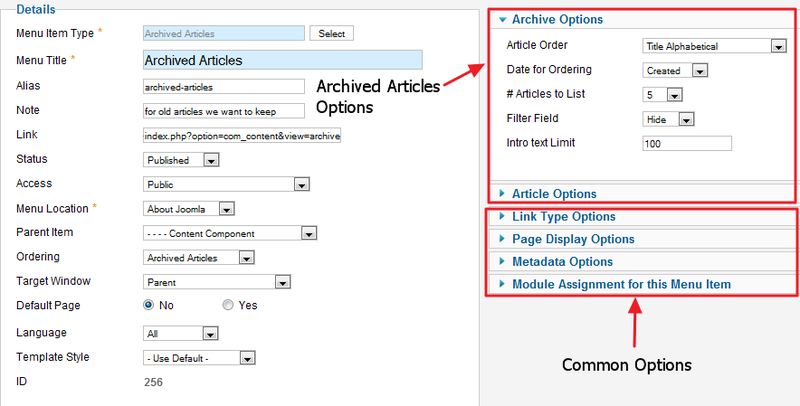 Click the Menu Item Type Select button and then click the Archived Articles link under Articles. Used to show a list of Articles that have been Archived and can be searched by date, as shown below. Filter Field. (Hide/Title/Author/Hits) Whether to show a Filter Field for the list of articles. If Hide, no Filter Field is shown. Otherwise, the Filter Field is shown using the selected field (Title, Author, or Hits). The Archived Articles Layout has the following Article Options, as shown below. 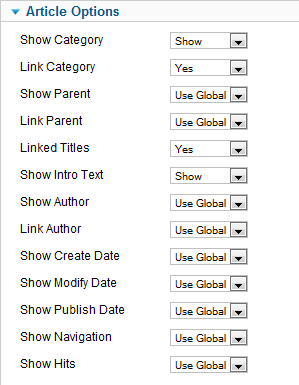 These options determine how the articles will show in the layout. In addition to Yes/No or Hide/Show, these options allow the Use Global setting. 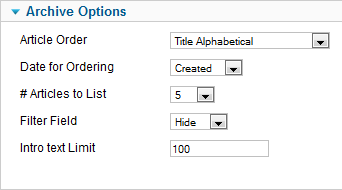 This uses the default value from Article Manager Options.